I’ve alluded to some of these in other posts, but it seems as if it is worth describing exactly what it is like (for me) to have the early stages of Parkinson’s. I suppose that the thing that springs to mind, for most people, when you mention Parkinson’s, is the tremors. Shaking, palsy – call it what you will, it’s the same thing. But a lot of things characterise Parkinson’s and, as I understand it, tremors are not the most conclusive. When I was first diagnosed, my mother told me a dreadful little story about one of her elderly neighbours, who was apparently diagnosed with Parkinson’s and then, several years down the line, he was told “Oh no, you haven’t got Parkinson’s – it was just a bad case of the shakes”. I think she intended to comfort me with that sorry tale of casual misdiagnosis (followed by such a vague alternative! ), but it really didn’t work – not least because “the shakes” were barely there at all for me. My own symptoms seem to be characterised by a tenseness. It feels as if every affected part of my body (with the possible exception of that sticky out thumb) is trying to curl up into itself. My left arm doesn’t hang straight; it bends at the elbow. The fingers on my left and cleave tightly together (so much so that you can see the white pressure points) and curve just a little too far in towards the palm. The thumb often sticks out, almost at a right angle. The toes on my left foot curl in towards my foot, and the foot itself is, more often than not, pointing in towards the unaffected right foot. This causes my left foot to roll outwards, so that my weight rests on the outer edge of the sole, which is not comfortable. All of the muscles down my left hand side seem to be pulling at once, all the time. Constant tension results in muscular ache, which I can relieve somewhat with exercise. Yoga helps with this – it’s all that stretching – but so do vigorous aerobic types of exercise. I did think, at one point, that the tension might cause the tremors (all that taut energy must be released somehow), but my consultant disabused me of this notion. Apparently they are separate. I do get tremors. They are usually quite mild, but they increase with nerves and, to a certain extent, tiredness. Then there is the lack of response. One person, more knowledgable than many, asked me if I got paralysis. Slightly taken aback – I had never thought of it in these terms before – I acknowledged a certain selective, temporary paralysis. But really, it is just slowness. Everything will move – just not always straight away, and not always as rapidly as I’d like. Apparently it is not uncommon, later on in the progression of the condition, to feel as if your foot is stuck t o the floor. Part of that slowness is a sort of jerky, ‘cog wheel’ motion. Smooth movement is one of the things that dopamine does for you. Lose the dopamine, and the smoothness of movement goes. 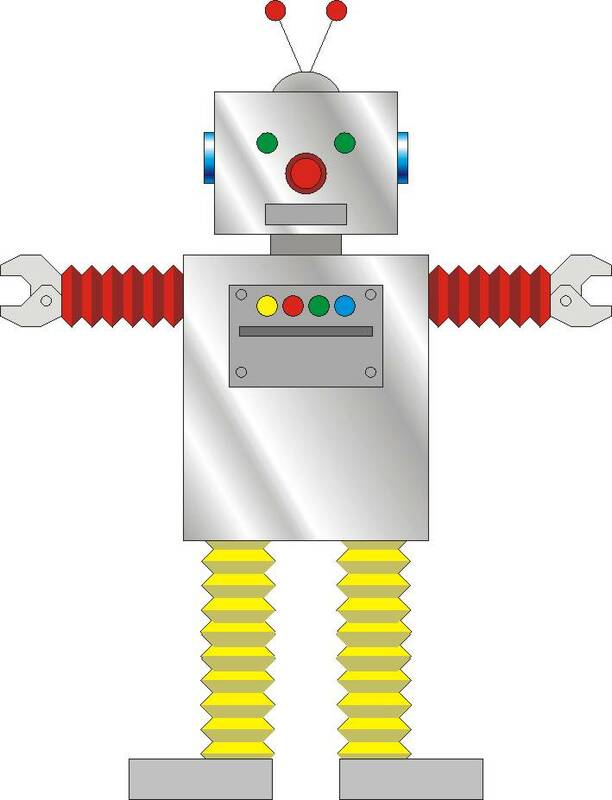 I sometimes feel like a robot in need of oiling. Categories: Symptoms, Tremors | Tags: Misdiagnosis, Young Onset Parkinson's | Permalink. You might think, given that I enjoy cycling and that I lack Parkinsonian symptoms while doing it, that I’d be using it as my primary aerobic exercise. I may yet, but I have a few curious issues with this idea. The first is that, as far as I’m concerned, cycling is for getting around. It’s a means to an end, not an end in itself. I had a bike before I had a car, and I used it to go places. I kept the bike after I bought a car, and I used it – when I could – in preference to the car because it was cheaper (a triple whammy of maintenance, fuel and parking charges) and because, crucially, it was decidedly greener. I also liked being outside. The fact that cycling improved my fitness was just a nice side effect. I’ve never really been bothered about ‘going for a bike ride’. The joy of cycling, for me, comes from the efficiency of a good bike in an appropriate situation. I liked the fact that it was marginally quicker to cycle to work along the A4 at rush hour than it was to drive. I liked being able to whoosh into town at lunch time and not have to worry about parking or causing pollution. I liked being able to move around a city without it taking ages and without waiting for buses. The second is related to the first in that I feel I have nowhere to ride. I don’t want to ride in circles around the village. 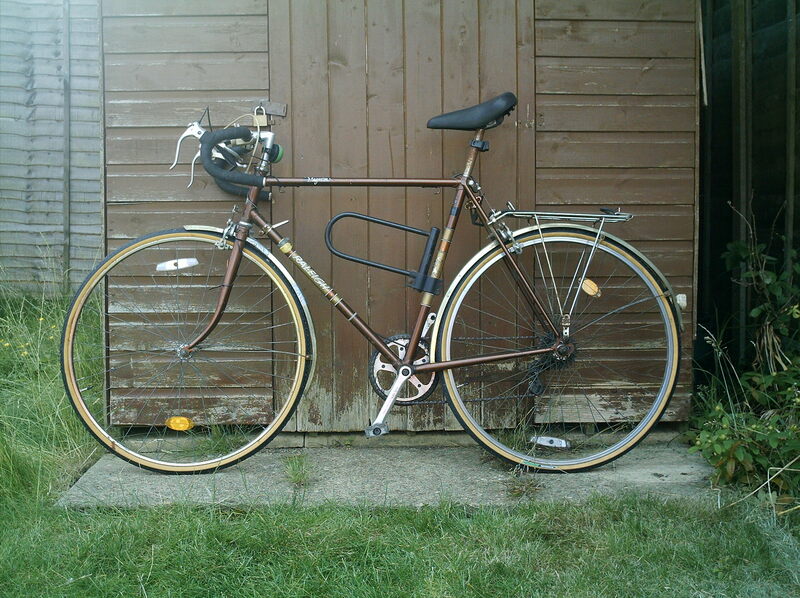 The shops are such a short distance away that by the time I’ve dug the bike out of the shed I could have walked there. The nearest towns are 7 miles or more away and I don’t quite feel up to facing that sort of distance, let alone the main roads. I certainly don’t want to risk life and limb on a destinationless ride around twisty country roads where I’m likely to meet some idiot driver going too fast who doesn’t see me until the last minute. I suppose, really, my issue is a very personal one. I enjoy cycling for what it is, a means of transport, and I don’t want to kill that enjoyment. Even when I had no car, I always had a choice; in bad weather, I did resort to the bus, or I walked. But when the primary object is fitness, buses and walking don’t exactly cut the mustard. But… my yoga class is (for now) right at the other end of the village. I refuse to drive that sort of distance and it is far enough to make it worth the bother of digging the bike out of the shed. There’s a stonking great hill just before you get there, and I can’t make it up that at the moment (oh, I suppose low mountain bike gears are good for something). So that’s one bike ride. Once a week (during term time). I’ve also worked out another. The village got bypassed at some stage and part of the old main road is nice and straight and largely junctionless. From here, I can get to that road, bez up it, slowing down as it gets a bit steeper (but not too steep for the lowest of my 5 gears and my lack of fitness), and then come back along a reasonably wide and straight bit of the new main road. As a bonus, the main road bit is slightly downhill, which means it’ll be a cinch to keep straight and steady. It took me about 20 minutes yesterday. I quite enjoyed it. I think I’ll go and do it again. Categories: Coping, Cycling, Exercise | Tags: cycling, Exercise, Parkinson's, Young Onset Parkinson's | Permalink. I hadn’t really ridden a bike for a while when I discovered that I had Parkinson’s. I used to ride quite a lot, though; I cycle commuted a modest distance for several years, and I was quite fond of my bike. I’d stopped cycling when I had children and hadn’t really had the opportunity to get back on the bike properly since. When I talked to the health professionals about Rasagaline (brand name Azilect), I was told that it ‘gives you back a year’. I wasn’t sure what that meant, but I do now; with Rasagiline, I feel roughly the same now as I did a year ago, without it. That’s good enough for now, but it’s not perfect. I still get tension and tremors in my left hand limbs, they’re just not as bad as they were before I started taking the drug back in July (it takes about a month to kick in, so the effects aren’t instantaneous). The advantage is that there are no noticeable side effects and, as a bonus, it may also have a protective effect on my remaining dopamine receptors. Maybe. I don’t think that that has been proven yet. There was a question regarding diet and a substance called tyramine. Tyramine is a product of the aging of food proteins; it occurs in many cheeses, especially hard cheeses such as cheddar, as well as preserved meats and game. It is also present in soya beans and board beans, so vegetarians don’t get off lightly, either. Tyramine affects the same parts of the brain as some monoamine oxidase inhibitors (the class of drug that Rasagiline falls into), and the general advice is to avoid tyramine containing foods if you are on one of these drugs. Overstimulating these parts of the brain can be dangerous; warning signs include headaches. Tyramine may also provoke migraines, so some migraine sufferers also strive to avoid it. It’s quite difficult to avoid. Fortunately, after a few weeks of trying to avoid tyramine, I discovered that, because Rasagiline is a selective monoamine oxidase inhibitor, the warning is more of a caution. I’ve reverted to my usual diet, which includes cheese (not much preserved meat or game, though) and have encountered no noticeable problems. Categories: Medication | Tags: Azilect, monotherapy, Parkinson's, Rasagiline, year | Permalink. So, anyway. Exercise. I’ve just spent a fair bit of sitting down time telling you why I don’t like exercise (yup, that’s right – I was decidedly not doing any exercise). Why must I do it? Flexibility: Parkinson’s patients often lose flexibility through lack of use. In particular, I’m told that I should be aware of the flexibility in my back; I should maintain the ability to twist and bend my torso. Core Strength: This is strength in the torso. Building up core strength improves stability and helps counteract the muscular rigidity that Parkinson’s can induce. I’m not sure if the shoulders are necessarily included within the ‘core’ area, but my physiotherapist encouraged me to work my shoulders to keep my arms functioning. Aerobic or Cardiovascular Exercise: ‘Big’ exercise that improves the strength of the heart and lungs. This sort of exercise is activity involving the large muscles, such as the legs, and has lots of health benefits such as lowering blood pressure. It also burns lots of calories. And, it turns out, it helps prevent further loss of dopamine functionality in the brain, as my physiotherapist told me recently. My physiotherapist suggested a range of aerobic exercises, including using a trampette, skipping, dancing, swimming and cycling. Running would be included, too, but I can’t recall if we discussed it. Certainly, on the occasions that I have tried running for fitness purposes in the past I have found it very hard on my lower legs (not to mention very tedious). The problem, of course, is fitting these things in with my lifestyle. I may not be working at the moment, but my day is restricted by the necessity of taking children to school and collecting them, and by a number of other commitments (all of which come before housework, naturally, but that still – alas – needs doing, too). My village location means that swimming involves a drive of around 10 miles on top of the usual faffing around. I have reservations about cycling purely for exercise, too – although these are complicated and I will probably cover them in a later post. I’ve bought myself a trampette (I was very pleased to find one in a sale with free postage) and an adult sized skipping rope. I’m already enrolled on a yoga course – in the village, which is brilliant both for its location and because I rather enjoy it. I’m not, however, very good at doing yoga out of the class. Stand on the centre of the rope and raise the handles until the rope is tight. The handles should be level with the centre of your chest. I’ve also tried to make the trips to and fro school more fitness friendly. Where possible, I try to ensure that I’m not carrying anything extra so that I can run part of the way when it’s just me, no kids. I’ve even dug my (cheap, old) running shoes out. The kids have got scooters and they are very good about carrying bags on the handlebars, so they whizz off on their scooters and I run to catch up. Some days, I’m able to leave both scooters in the preschool buggy park, so I can run home unencumbered. I’m not up to running all the way yet. It’s not far, mind. Maybe I can work up to it. I’m also managing to do at least 3 x 10 lifts a day with my hand weights, more if I get the chance. I like these. They don’t take up much space (neither to store nor to practise) and they don’t take up much time. I can also use the ‘rest’ period between each set of 3 lifts to read a few paragraphs of my current book… (maybe I overdo the rest bit. Sometimes I need to read a bit more than a few paragraphs). It also feels like they are doing something. I’m most concerned, right now, about my arms, and the lifting is meant to work my shoulders; the benefits should effectively spread downwards. Maybe it won’t improve the dexterity of my fingers, but hopefully it’ll help that weak wrist. I gather that keeping my shoulders strong helps me to combat that rigidity issue. I really ought to work at the exercises the physiotherapist gave me more. She gave me loads, which I found a bit confusing. The weights were on the first page – the most advanced of a series, and I was pleased to be able to do them, and, indeed, to graduate up to 3 x 15 repetitions of the first weight (1kg) and then on to 3 x 10 of the next weight (1.5kg). The other stuff she gave me includes a lot of bends and twists. Some of it is also covered by yoga. I’ll write more about yoga another time. Categories: Exercise, Physiotherapy, Young Onset Parkinson's | Tags: aerobic exercise, core strength, flexibility, skipping, skipping rope, trampette, yoga, Young Onset Parkinson's | Permalink. Oh, the irony of it. After a lifetime of avoiding exercise for the sake of exercise, I am told that I must exert myself in that direction. Am I unfit? Probably. Not ridiculously so; I have a perfectly reasonable body shape, I’m not overweight and I’ve never had problems associated with a lack of exercise. It’s just that my philosophy on exercise has always been that it should be useful exercise. So, walking instead of catching the bus or driving a car; cycling where possible; parking just a little bit further away from the shops in order to avoid exorbitant parking fees. Maybe a bit of swimming to remind myself how to do it just in case I fall in the river. Oh, and walking for pleasure. The thing about walking is that you can look around and enjoy what you see; if you’re going much faster you need to be looking out so that you don’t collide with anything. I was always a bit clumsy. Maybe that’s why I didn’t take to P.E. and Games at school. Tall and just a bit gangly, I never had the coordination to catch a ball, to throw it properly, nor even to run effectively (it was as though these long legs of mine just dragged; I never quite tripped over them, but it was always a possibility). I disliked team sports because, being inherently bad at them, I let down the rest of the team. I also found most sports boring, both to do and (especially) to watch. I learnt to swim and was lucky enough to learn how to ride a horse. I enjoyed that, mainly because of the interaction between animal and rider. I was even reasonably good at it, but it was expensive and time consuming, so we stopped riding by the time I was 16. I also learnt to ride a bike, but didn’t take to cycling when I was a child because I wasn’t allowed to go anywhere worth going. My parents thought the roads were too dangerous and so I was restricted to the estate, which I could just have easily walked around. Eventually, I stopped using the admittedly rather dreadful bike I had (it was a shopper style bike, bought for me because it was very adjustable in size; I understand the economy, but deplore the reality). It languished in the garage for a while and eventually got given away. In the meantime, I walked everywhere. Even at university, I walked. The buses were expensive in Brighton and Hove, and the timetables nigh on incomprehensible (I did use the local rail service to get to the campus, though). Then I moved to Hull (more properly known as Kingston-Upon-Hull; the locals just refer to it as ‘Ull). After 8 or 9 months of walking (the buses were cheaper, but old habits die hard), it occurred to me that, because Hull is very flat and there were no hills worthy of the name, it might be a nice idea to try cycling again. To cut a long story short, I bought a bike (a second-hand sports tourer) and found that it was a jolly useful thing and that I rather enjoyed cycling. I moved to Southampton, worked out how to use the friction gears, and carried on cycling. I got a proper job and bought a car because home and work were too far apart, but I still used the bike to go into town (Guildford, at that point) at the weekends because the car parking was very expensive. A new job and another move brought home and work within 5 miles of one another. I jumped gleefully back on my bike (replacing it with a slightly better one) and left my car at home most of the time. That was probably the fittest I ever was. I pretty much stopped cycling when my first child was born, and since we’ve moved to a village, there is less reason for me to cycle even when the children are out of the house at school and preschool. It’s barely worth digging the bike out of the shed to go somewhere in the village, and the roads to the nearby towns are much scarier to cycle along than the roads within most towns (think traffic speed and the expectations of drivers seeing bikes). So now I have to exercise, and I can’t think of any useful ways to do it. Just taking the kids to school / preschool isn’t good enough; I need to do “about an hour” of cardiovascular type exercise to minimise further dopamine losses. I also need to work on my “core strength” and to maintain my flexibility. Categories: Cycling, Exercise, Zalastory | Tags: cycling, Exercise, Games, Horse Riding, P.E., Walking | Permalink.